At www.megapoolandspa.com, we have several models of above ground swimming pool lights. We have cheap above ground pool light with colors as well as halogen and LED pool lights. Reduces chemical consumption 60-90% while maintaining crystal clear-germ free water! Ozone is rapidly becoming the sanitizer of choice in bodies of water all over the world. In Europe ozone is so effective at killing contaminants that it is used to purify the drinking water in most countries there. Ozone produces oxygen molecules that are an extremely powerful sanitizer, killing 99.99% of all bacteria, viruses and molds on contact. Del Clear’s Corona Discharge System produces 5 times the amount of germ killing ozone as other units. Now with Del Clear you can use this powerful sanitizer that uses no chemicals to keep your above ground pool water safe and crystal clear. With our ozonator you can reduce the use of chemicals up to 90%. 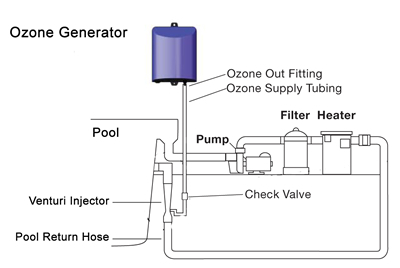 Ozone is 100% natural (it’s pure oxygen) and it insures a healthy, safe pool. The unit is easy to install, completely automatic, and is effective on pools up to 25,000 gallons. Enjoy the benefits of ozone this season with the powerful Del-Clear Corona Discharge Ozonator. What is the difference between clear and blue swimming pool solar covers? Megapoolandspa.com offers two types of swimming pool solar blankets. We have blue and clear solar pool covers. Blue swimming pool solar blankets are the most economical and commonly purchased. They are also lighter weight than the clear cover. The clear swimming pool solar covers allow more sunlight to pass through the cover and heat the pool water. Swimming pool solar covers lay directly on the water and trap heat which allows you to swim in water 10-15 degrees warmer than normal. You can start swimming earlier in the year and close the pool later than you usually would. These insulating thermal blankets are made of plastic and contain thousands of air bubbles. Sunlight is able to pass through the sheet to heat the water, but the thickness of the plastic and the air pockets act as an insulating barrier to retain the heat in the water. By trapping the heat from leaving, you will not need to run your pool heater as much. You can easily trim the covers to fit and they can be rolled up used with a solar reel or folded and put away. Evaporation is a main cause of heat loss. These “bubble covers” as they are also called, act as a barrier to stop your water and chemicals from entering the air. We offer two styles of solar covers. The blue opaque solar pool blankets covers are the standard 8mil for above ground pools or 12mil for inground pools. The Magni Clear solar pool covers are 14 gauge and since they are clear and not as opaque, they allow more sunlight to penetrate to the pool surface. Covers should be used when the pool is not in use. If there is a lot of sunlight or the ambient temperature is high, you may not need to cover your pool during the day, but it’s a good idea to cover your swimming pool at night to prevent heat and chemical evaporation. On cloudy as well as windy days, it’s recommended to keep the pool covered. When you first get your blanket, lay it out and wait a few days before you trim it to size. You want to allow the blanket to shrink and expand due to the folds, pleats, and exposure to sunlight. Then, you can use a pair of scissors to trim the cover to size as close to the pool wall if needed. The solar cover should be placed on the water with the bubble side down, smooth side up. This increases the surface area for the sun to penetrate and makes the air bubbles act as insulation to keep the heat from escaping. Mega Pool and Spa always has the lowest prices on pool supplies. From time to time, we’ll offer our customers even greater savings!!! If you would like to receive coupons for pool supplies , please visit our site and sign up for our mailing list.